What do flower and gem essences do? A question I am often asked and one which those of us who use essences find it so hard to answer. And so as often is the case, evidence is needed and here is some of the best that I can offer you. Just look at the difference between these two trays of lettuce….the only difference is that one was misted with essences and one was not. In Spring 2012 I was inspired to “experiment” with using flower essences in my garden. My “experiment” was not documented in any other way other than the photos (see above) and started out as a bit of fun. 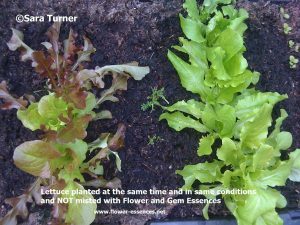 The lettuce seed were planted in organic peat free soil in trays that sat next to each other. The seeds were sown at exactly the same time and received exactly the same treatment – watering when needed, taking the covers off during the day and replacing at night to protect from snails. I also sowed a line of marigold seeds between the lettuce to deter aphids. The ONLY difference was that one tray was misted with flower essences and the other was not. As those of you who live in Northern Europe may remember, Spring 2012 was cold and cloudy. Tuning into the soil, I felt strongly that some vibrant energy was needed. I watered one tray with water containing the MoonFlower Orange Calcite Gem Essence and the other with water only from a different watering can. I then left both trays for around a week to gather energy. I then sowed the seeds in both trays at exactly the same time and in the same manner. One tray I began misting with the Alaskan Essence Grove Sandwort. I chose Orange Calcite and Grove Sandwort as Steve Johnson states in his book “A guide to the Alaskan Essences” that Orange Calcite “helps build up life force in the garden” and that Grove Sandwort “helps transplanted seedlings establish new roots of communication with the Earth”. The misting was done each evening. I first covered the tray which did not receive essences so that the mist did not travel to this tray. Once this tray was covered, I misted the earth around the roots of each lettuce and the leaves of the second tray and then placed the cover on for the night. Before closing the air vents at each end of the cover, I misted into each end of the tray and then closed the vents. 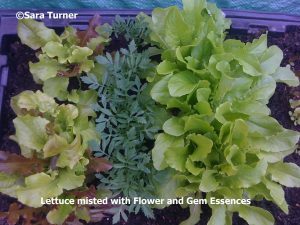 When I first began, to be honest, I did not really expect anything much to happen especially as life had been pretty busy and my care of the lettuce had been minimal. Yet after several weeks, it became apparent that there WAS a difference emerging. I then added a second essence to the mister – my own MoonFlower Pink Camellia Essence. Pink Camellia is all about allowing our true potential to shine forth into the world and I intuitively felt that the lettuce would benefit from this vibration. It was when I added Pink Camellia to the water, that the difference between the two trays became very noticeable as you see in the photos above. The essences that were mister were not only larger and lusher but much more “snail resistant”. You can see in the photos, that in the tray that was not misted, the marigolds were eaten yet in the tray misted with essences the marigolds grew strongly and healthily. Everyone we showed the lettuce to were amazed and this was such an educational experience for me. 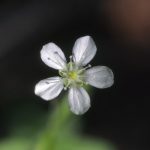 If you’d like to find out more about using flower essences in your garden from transplanting seedlings, protecting plants from frost and helping your plants grow healthily and happily at all times of year – both inside and outside your home, then I have recorded this audio interview to share more information. If you’d like to purchase an Orange Calcite Gem Essence or Pink Camellia Flower Essence from the MoonFlower Range, here are the links to our online shop. I encourage you to use essences yourself in your garden and like me, if you persevere, you will also see wonderful differences. I’d love to hear your experiences and I invite you to leave your comments on this blog.